Over the week of April 3 to 10, there were four transactions that crossed the $10 million mark. The chart topper was a five-bedroom unit on the first level of luxury condominium Leedon Residence that fetched $12 million ($1,828 psf). The 381-unit, freehold Leedon Residence, developed by GuocoLand, was completed in 2015. 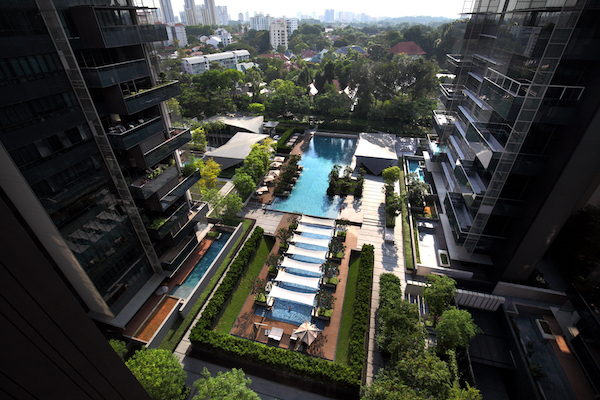 It is located on Leedon Heights in prime District 10. The buyer of the 6,566 sq ft unit at Leedon Residence is a Chinese national, says Dominic Lee, head of the luxury team at PropNex Realty who brokered the sale. This was not the only unit purchased by the buyer, who is believed to have snapped up another unit at New Futura, a luxury freehold 124-unit condo by City Developments located on Leonie Hill Road in prime District 9. At Tomlinson Heights, a 4,047 sq ft, five-bedroom unit on the second level of the 36-storey tower was sold for $10.5 million ($2,594 psf). The 70-unit boutique, freehold development by Hotel Properties is on Tomlinson Road in prime District 10 and was completed in 2014. Two other deals were for detached houses. One was a bungalow on Paradise Island in Sentosa Cove that fetched $11.2 million, according to a caveat lodged on April 10. The house sits on a land area of 8,633 sq ft. Like all the properties in Sentosa Cove, it has a 99-year lease. The seller purchased the house in a sub-sale for $10.5 million ($1,216 psf) in 2009. Another transaction that crossed the $10 million mark was a detached house on Chancery Lane in prime District 11. The house occupies a freehold land area of 4,338 sq ft and fetched $10.5 million ($2,419 psf). This year has seen an increase in the number of non-landed private residential property purchases by foreigners, including permanent residents. This is particularly noticeable for transactions above $5 million. According to Nicholas Mak, executive director of ZACD Group, deals above $5 million saw a 78% jump in the January 2017-March 2018 period from the October 2015-December 2016 period. Chinese were the biggest buyers, followed by Indonesians and Malaysians, adds ZACD.